As a beautiful Easter Day came to an end, thoughts of a painting I did last week comes to mind. The first time I saw carrots other than the usual orange carrots I found them fascinating and I wanted to learn more. Did you know there is actually an England’s Carrot Museum? Did you think the original carrot was orange? Nope. Carrots were originally purple and yellow and originated about 5000 years ago in present-day Afghanistan. It’s thought the mutations and natural hybrids derived from both cultivated and wild varieties of purple and yellow carrots producing an orange “mutant” carrot. Around the 16th century, the Dutch took these mutant orange carrots and created a sweeter orange “western carrot.” It’s is said these were invented by Dutch growers to honor the House of Orange, the Dutch Royal Family. • Purple carrots (usually orange inside) get their pigment from an entirely different class, the anthocyanins. These pigments act as very powerful antioxidants, grabbing and holding onto harmful free radicals in the body. Anthocyanins also help prevent heart disease by slowing blood clotting. These originate in Turkey, and the Middle and Far East. • Yellow carrots contain xanthophylls, pigments similar to orange beta-carotene, which help develop healthy eyes and aid in the fight against macular degeneration. They may also be useful in preventing tumors associated with lung and other cancers. These came from the Middle East. • Red carrots contain lycopene (another form of carotene). a pigment also found in tomatoes and watermelon; lycopene helps in the fight against heart disease and some cancers, including prostate cancer. These were originally from India and China. • White carrots, by their very nature, lack pigment but may contain other health-promoting substances called phytochemicals. One would say there are the least healthy of carrots. They originate from Afghanistan, Iran, and Pakistan. • Orange carrots contain beta-carotene, with some alpha-carotene, both of which are orange pigments. The body converts the high content beta into Vitamin A, essential to the immune system for general well-being and healthy eyes. These carrots originated from Europe and the Middle East. The next time you are out shopping try a rainbow bunch to add color to your meal, and a colorful boost of health-giving properties. 3 comments to Rainbow Carrots! Who Knew? Just goes to show, one can learn in and from many sources. Loved the watercolor and the info, Mickey! Thank you Elaine, in addition to the religious aspects of Easter my head goes to rabbits then carrots, now rainbow carrots, eggs, Easter egg hunts, filly dresses on little girls, black patten leather shoes with white socks with lace, small boys in bow-ties, and on and on. HOpe you had a delightful Easter. 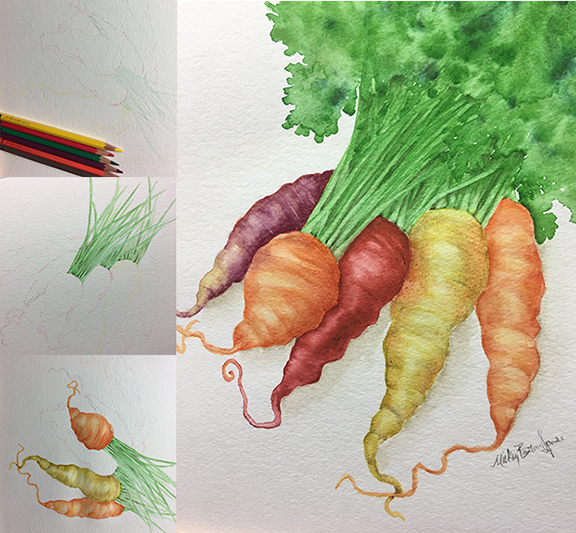 Love, love, love your painting and was so glad to learn these interesting facts about carrots! The first time I ever saw multi-colored carrots was at the Santa Fe Farmer’s Market (which is, itself, a riot of color). Our daughter and her husband live there and I love getting down to the market as often as possible.